...that the inhabitants of Reach are of mainly Hungarian descent? ...that crouching while jumping gives the player extra height? This article is about the campaign level. For other uses, see Requiem (disambiguation). Investigate the Forerunner structure and look for the Terminus. Halopedia has a walkthrough guide to this level, Requiem (level). See Requiem (level)/Walkthrough. 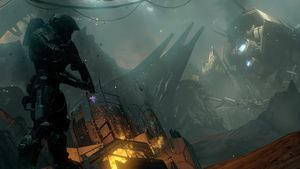 Requiem is the third campaign level of Halo 4, and the second one with actual gameplay. Completing the level on any difficulty unlocks the "Requiem" achievement, worth 10 Gamerscore points. The "Midnight Launch" achievement, worth 20 Gamerscore points, is awarded exclusively in this level for making a jump in a Warthog while the Xbox 360's system clock is set to 00:00 AM. In Halo: The Master Chief Collection, "Requiem" is unlocked with the same criteria and awards the same amount of Gamerscore. "Midnight Launch" has been removed, however. Accessing the level's terminal unlocks "War", worth 5 Gamerscore points. "Interloper" and "Dark Fortress", each worth 10 Gamerscore points, require beating the level's 15 minute par time and 22,000 point par score, respectively. What remains of the Dawn plummets through Requiem's atmosphere, eventually slamming into a small canyon. Cut to black. Fades in to the wreckage in the area. An assault rifle lies on the ground, with John-117's right hand next to it. His hand stirs and tightens. The Chief shoves some debris off his chest and rises, observing his surroundings. He switches to a kneeling position and grabs the rifle. Cortana: "Checking coordinate impact data..."
Cortana (rampant): "We have asked you to give up your family, your childhood, your future..."
John shakes his head in confusion, and pulls Cortana's data crystal chip out of his helmet. Her avatar appears above it. Cortana: "I'm sorry. It's the crash. I'm fine." John-117: "Something was wrong before we left the Dawn." Cortana: "Chief, (distorted) really, I'm fine." Cortana: "I was put into service eight years ago." Cortana: "AIs deteriorate after seven, Chief." John snaps back to Cortana. John-117: "We need to find Halsey." John-117: "She made you. She could fix you." Cortana: "I won't recover from rampancy, Chief." John-117: "If we could just get back to Earth and find Halsey, she could fix this." Cortana: "Don't make a girl a promise you can't keep." A Phantom and two Banshee escorts speed past the crash site, interrupting the duo. Cortana: "We need to move!" Cortana's avatar disappears. John readies his rifle. 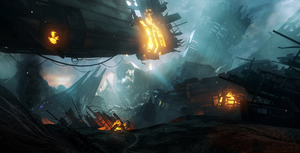 John-117 walking through the Forward Unto Dawn's wreckage. Cortana: "Doesn't look like the Covenant fared much better than we did." John-117: "How many ships made it through the roof?" John-117: "We still need a ride home." The Chief traverses the crash site, which is littered with Covenant dead and dying. Cortana: "There's a crevice we can use to get through the rocks over there. See the waypoint on your HUD." Cortana: "Chief, we need to find a working ship so we can get off this planet." Cortana: "Chief, check your ammo. You might want to go easy until we can locate some more. Given all this debris, chances are you'll find something the Covenant won't want shot at them." A hallway section to the right contains a still-active UNSC computer terminal. Terminal: "Catherine Halsey research excerpt - 11 February 2550." Dr. Halsey (Terminal): "The interesting factor here isn't that H-1 disabled the viral termination code I implanted in her matrix. These metrics imply its success wasn't just unlikely, but that even the accepted seven-year life cycle estimates may not apply. Thus far, I've determined that the unique circumstances of her creation have triggered what I can only refer to as a recessive variant in the AI seed. As her architect, I'm currently at a loss as to the origin of this rogue element. Very...curious." Nearby, a Battlenet access point aboard a crashed Lich dropship also remains online. Cortana: "The console's still got some power in it." The Chief activates the terminal. Cortana: "This communication's being broadcast to all Covenant in the area. Let me put it through translation." The Sangheili broadcast is put through the comms system. Cortana translates. Cortana: "Non-believers walk the sacred ground. Purge the heretics, so that they do not foul the air of Paradise. The time has come to enter the Great Light. The Promethean awakening is nigh...our reward is at hand." John-117: "It sounds like the Covenant were here looking for something." Cortana: "It's the Covenant. Aren't they always looking for something?" The Chief proceeds to walk up the cliff side. On the other side of the crevice, a malfunctioning Covenant console can be found on top of a second crashed Lich. Cortana: "What is that? Chief, see if that terminal is still active." The Chief activates the device, allowing Cortana access. Cortana: "The Covenant have been broadcasting that from an equidistant orbit every 30 minutes for the last three years." John-117: "They've been waiting outside the planet for three years?" Cortana: "Apparently, they couldn't get in." The Chief eventually leaves the crash site through the nearby crevice. Shortly afterwards, a comms signal is detected by Cortana. Cortana: "I'm picking up a faint transmission on the high-band." Cortana: "I don't think so... The pattern's different. I'll try to triangulate its position." The Chief exits the crevice and emerges onto a cliff edge. Sprawling Forerunner structures cover the entirety of the abyss below, merging seamlessly with the surrounding mountains. In defiance of gravity, great spires reaching into the clouds hover serenely above the complex; an awe-inspiring demonstration of the Forerunners' technological mastery. A hangar bay from the Dawn rests nearby, containing several intact Warthogs. Cortana's prerecorded distress call is still looping through the bay's speakers. Cortana: "Warthogs...and still in one piece. Nice to see your luck is holding out." The Chief boards one of the intact Warthogs and begins driving. Cortana: "Chief... About my "condition"? I didn't want to mention it since it's a complete longshot, but since you brought it up... It is possible that getting home could help me find a solution to my rampancy." Cortana: "Well, as far as I know, I'm the only AI ever generated from living tissue - a clone of Doctor Halsey, to be precise. It may be possible to recompile my neural net by replicating those same conditions. But that means getting back to Halsey. Soon." The path ahead leads to a series of small caverns, covered with both UNSC and Covenant debris. Cortana: "Chief, I'm hearing that strange signal again. Stronger this time." John-117: "Do you think there's something to it?" Cortana: "I'm curious, more than anything. Its behavior is...odd." A valley near the Forward Unto Dawn's crash site. The caverns eventually give way to a small valley, occupied by Covenant Phantoms and infantry. 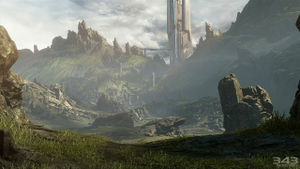 The hillsides are dotted with small Forerunner columns, with a single large spire looming in the distance. The Chief engages the hostiles in the immediate area and neutralizes them. Cortana: "Chief, several patrols just reported in outside that structure over the ridge. It's possible they're on to something." The Chief speeds through the valley with his Warthog, evading snipers and blockades along the way. A single Sangheili Zealot wielding a concussion rifle emerges from a small crevice and attacks. The Chief kills the Sangheili and proceeds on foot through the crevice. Another group of Unggoy, some with heavy weapons try to stop the Spartan, but fail. Cortana: "If we're going to hijack a ship from these Covenant, we're going to have to find where they're landing first." John-117: "I don't suppose you have a plan for that?" Cortana: "We could always ask nicely..."
John-117: "Asking's not my strong suit." The crevice leads to the base of the large spire, which is being held by a large contingent of Covenant. The Chief neutralizes them one-by-one, eventually arriving at the main entrance. A single cloaked Sangheili Zealot waits with a large group of lesser Covenant. Once enough are killed, the Zealot charges at the Chief. John-117 kills it and it drops something. Cortana: "That Elite dropped his camo module. Let's have a look." The Chief picks up the active camouflage unit. A schematic of his armor is displayed as the Covenant hardware is integrated into the system. Cortana: "I'll run a soft patch to it from the suit. Never know what might come in handy." The Chief enters the entrance. The doors briefly seals him inside the antechamber. Cortana: "There's that phantom signal again." The transmission is still mostly static, but what sounds like voices can be heard. John-117: "I heard something that time." The door opens, allowing the Chief inside. The interior chamber is partially merged into the cliffside, with sunlight pouring in from above. As the Chief walks up a raised platform, a squadron of Aggressor Sentinels suddenly rises from below. Cortana: "I wondered when they'd show up." The chamber springs to life, with several platforms and columns emerging from the floor, which is littered with the bodies of Covenant infantry who fell to the Sentinels. A small alcove can be found beneath the main path. A hovering sculpture lies inside, carved in the shape of a ubiquitous Forerunner symbol and covered with glyphs. John-117: "What does it say?" Cortana: "'Guardianship for all living things lies with those whose evolution is most complete. The Mantle of Responsibility shelters all.' Very interesting..."
John-117: "Maybe. But it won't get us home." The Sentinels hold position above a Forerunner terminal at the other end of the chamber. Cortana: "There, Chief! A console, in the back." John approaches the console and inserts Cortana's data crystal chip into it. John observes as a hologram of Requiem appears over the Cartographer. Cortana: "It's a localized site Cartographer. Hmm...okay: In service of Forerunner Shield World, designate "Requiem"." John-117: "Requiem. At least we know where we are now." Cortana: "Let's see if it can tell us what the Covenant are so interested in." The hologram flickers to the Didact's symbol momentarily, then vanishes. Cortana: "I don't know...it locked up. I'm detecting power fluctuations in several locations. I'll put them up for you." Two new waypoints appear on the Chief's HUD, located on opposite sides of the chamber. Cortana: "Hopefully, we can find some way to get this Cartographer back online." The Chief proceeds to the first waypoint - a small chamber with a hovering platform in the middle. A golden beam of light passes through the platform, extending to both ends of the room. After activating a light bridge, the Chief proceeds to restore power to the first Cartographer core. His shields are immediately drained. Cortana: "It's all right. This energy is actually a ferroelectric data field... Your shields are just cycling in response to the chamber's charge." John-117: "Will this bring the Cartographer back online?" Cortana: "Partially. This type of processing system usually works in parallel. We'll have to locate its twin." The Chief exits the room, only to find that the Covenant have gained access to the main chamber. Cortana: "The Covenant - they found a way inside!" After neutralizing the hostiles, the Chief arrives at the second core and activates it. The signal immediately returns afterwards. While still garbled, the voices are now obviously human. John-117: "Is that the same signal?" Cortana: "Yes! Mayday, mayday, mayday! UNSC AI Cortana to UNSC Infinity, please respond!" Cortana: "No response. But from the strength of that signal, the Infinity has to be close by! The Cartographer should be back online. We may be able to use it to track the ship's location!" During John's absence, more Covenant lances have breached the chamber. Several are surrounding the Cartographer itself, including a pair of Sangheili. Cortana: "We can't give the Covenant access to the Cartographer. Clear them out!" The Chief eventually clears the chamber of Covenant infantry. Cortana: "That's it. Now quick, to the Cartographer!" John approaches the Cartographer yet again and accesses it. Cortana's avatar and a holographic control panel appear over the console. Her attempt to gain access is rebutted with an error tone; both the control panel and Requiem's hologram flicker red. Cortana eventually succeeds - numerous red circles appear on the surface of Requiem's hologram. Cortana: "The Cartographer keeps acting like the transmission is coming from everywhere on the planet at once. It doesn't want to triangulate Infinity's signal." Requiem's hologram flickers red again, and all of the red circles disappear. Instead, a red sphere appears in the center of the hologram. Cortana: "Oh wait...I got it." John-117: "That can't be right. Scan again." Cortana: "We've already passed through one layer of the planet surface. It's not crazy to think that someone else made it deeper inside than we did." John-117: "You mean the planet's hollow?" Cortana: "Let me see if I can figure out a way to reach these coordinates that doesn't involve us digging a really big hole." A diagram appears, displaying a map of the structure. Cortana: "There's a Terminus at the far side of the complex. We can portal to the planet's core from there." Cortana suddenly snaps back to the Cartographer. John-117: "If we have a shot of getting you back to Infinity, we're taking it." Cortana looks back at him and nods anxiously. John retrieves Cortana's data chip and walks away from the console. The Cartographer resumes emitting the error tone, while the hologram of Requiem briefly flickers to the Didact's symbol. Fade to black. The Chief enters a small antechamber. A machine is projecting several beams of light into a small raised platform. Four Hardlight Shield modules lie above it. Cortana: "Let's get to that Terminus and find Infinity." John-117: "What do you know about Infinity?" Cortana: "Not much. She was supposed to be massive, but the project was only in prototype when we left." John exits the room and into a large, open-air cavern. A large bridge spans its length, with an elevator lying dead ahead. Several Banshees and a Phantom are circling the area, while Covenant infantry patrols the bridge. Cortana: "Scouts, fortifying the bridge below. Stay sharp." Cortana: "Would it have killed you to use the elevator?" The Chief steadily advances through the causeway, liquidating Covenant forces along the way. An unoccupied Banshee is available for use halfway through. The exit leads into a small, enclosed valley with a large Forerunner complex. A massive spire is firing a golden pulse into the atmosphere. Cortana: "Chief, the Covenant net's going crazy. They're ordering all units to converge on the tower." John-117: "I guess we got their attention." The Chief blasts through hostile forces, eventually entering the spire. Cortana: "We're about to have our hands full. The Elites just issued a general order; they're moving all ground teams to secure the tower entrance above us." The Chief fights his way through more Covenant, and eventually reaches the third floor. At the main entrance on the third floor, a Mgalekgolo pair are being engaged by several Sentinels. Cortana: "The Sentinels are trying to keep the Covenant out!" With the Sentinels' assistance, the Chief manages to terminate the Mgalekgolo. Cortana: "While you were busy, I managed to clear up another transmission from Infinity." Captain Andrew Del Rio (COM): "(static)-artifact site?" John-117: "Sounded like he said "artifact"." Cortana: "I wonder if it's related to whatever the Covenant are after." The elevator room leading up to the Terminus. Cortana: "You do want to find Infinity and get off Requiem, don't you? Let's go!" The door opens, leading into a hallway filled with Forerunner machinery. Sentinels weave through the pillars, oblivious to the lone visitor. Cortana: "The map placed it at the top of the tower." A small Forerunner terminal can be found below the elevator, the first of seven. A small sphere composed of hard light hovers in the center of the terminal. The Chief activates the console, and the sphere dissolves. Cortana: "This node is caught in a loop trying to access something it's calling "the Domain", an offworld data repository of some kind, though I'm only able to extract bits and pieces of the complete exchange... I'll log it for investigation later." Cortana: "Chief, try the top of the ramp. I think there's a lift up there." The elevator reaches its destination. John leaves the platform and proceeds across a long bridge. He observes the chamber; there are countless pillars inside the room. The Chief reaches the end of bridge, and inserts Cortana's data chip into the Terminus. The console activates, and the Forerunner structures around them adjust themselves accordingly. Cortana: "According to the Cathedral, this Terminus is just one node of a larger transit grid that spans the entire planet..."
Cortana: "When I tried to access the outlet closest to Infinity's transmissions, the system responded with this." A holographic display of a Forerunner glyph appears in front of Cortana's avatar. Cortana: "That's the kicker. It's the Forerunner symbol for Reclaimer." John-117: "Humanity... That's got to be Infinity. Can you get us to those coordinates?" Cortana: "Let me try to open a portal." Cortana accesses the holographic control panel in front of her, activating the portal. John turns around to see the pillars in the room rising out of the ground. Cortana: "I'm picking up unknown energy signatures." Cortana: "This can't be right!" Bipedal machines, lit in blue and armed with hardlight rifles, teleport onto the top of the pillars, growling at the Chief. John raises his assault rifle in alarm. John-117: "Set a waypoint out of the tower." Cortana remains silent as she continues to access the control panel. A portal appears beside John. Cortana turns around in confusion. Cortana: "How did...? Quick! Into the portal!" John takes Cortana's data crystal chip as one of the creatures closer to him screams. John raises his assault rifle at the machine, which quickly teleports away. The Chief turns and charges into the portal. Cut to black. Cortana's line from the opening cutscene, "Don't make a girl a promise you can't keep", is a reference to a line she first said in Halo 2: "Don't make a girl a promise if you know you can't keep it." In the Halo 3 level Cortana, the Master Chief keeps the promise he made to her. 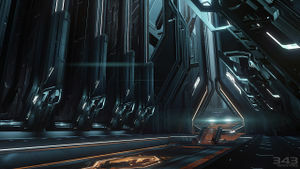 Cortana's line regarding the level's terminal is not used after the first playthrough unless all Halo 4 is removed from the Xbox 360's system cache. The terminals on this and all subsequent levels are likewise absent from subsequent playthroughs. However, on the Xbox One through Halo: The Master Chief Collection, the line can be played again regardless of playing Halo 4 multiple times. The design of the bridge between the cartographer and the terminus is very similar to those of the bridges seen near Installation 04's control room. Overgrowth in the cartographer's room was inspired by that of ancient Cambodian structures. Concept art of the cathedral. Concept art of the cathedral door. Early concept art of Requiem's spires. Early concept art of the level's environment, with hovering boulders instead of spires. Concept art of the Dawn's crash site. Concept art of John-117 emerging into the first valley. Concept art of John-117 driving across Requiem. Concept art of the cavern behind the Cartographer chamber. Concept art of the bridge spanning the cavern.